Are the lantern flies in Florida...I have a spotted like bug like this that will not leave the outside of my house. I took a picture of it and it looks similar minus the red undercoat, but I didn't get that close to tell. I zoomed in really good. I'm curious to know what I should avoid. @Angelica Hobbs - thank you for your comment. 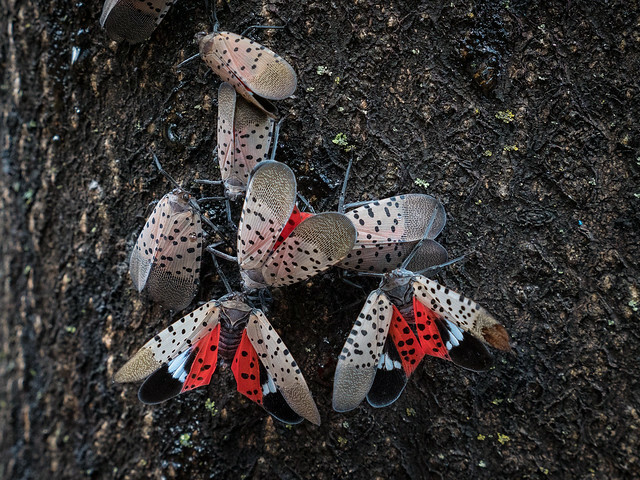 The spotted lanternfly (Lycorma delicatula) has been reported primarily in Pennsylvania, but also other states in the Mid-Atlantic and New England regions. We recommend you contact your local county Cooperative Extension office or the Insect ID Lab (PDF, 484 KB) at University of Florida’s Institute of Food and Agricultural Sciences (UF IFAS) to investigate.